The ability to correctly identify herpetofauna species is a core skill, whether your goal is for survey, professional consultancy or even just to correctly annotate your photographs. SARG can help to improve your identification skills starting now! try the new computer based training ID Quiz. This quiz is a proven method to improve ID skills, and provides a good foundation for more formal training, where you will have the opportunity to interact with experts. 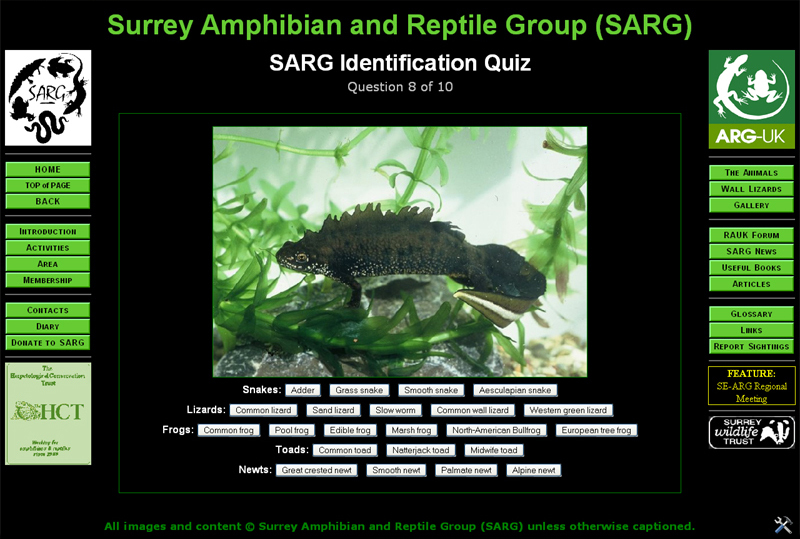 SARG runs formal identification and survey training each year (around Easter, check the SARG diary) in support of the national NARRS reptile and amphibian survey, run by the HCT. Additional courses can be run, subject to demand. 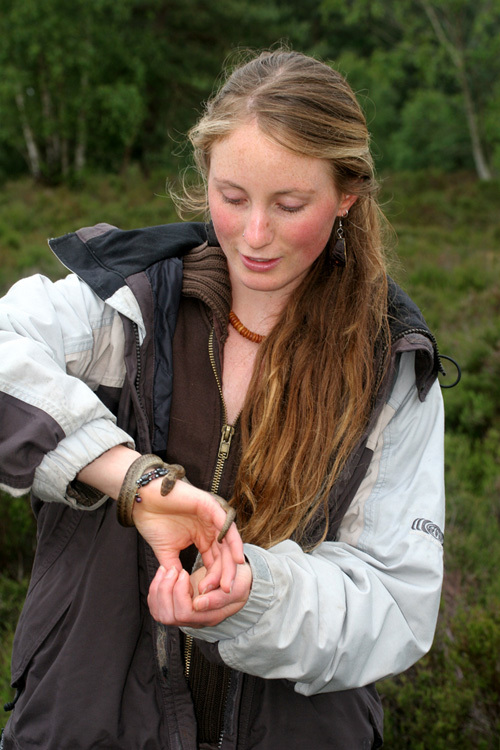 Reptile survey training at Lightwater Country Park, 2007. Much of the joy of herpetology comes from developing the skill of finding the wild animals in the countryside. 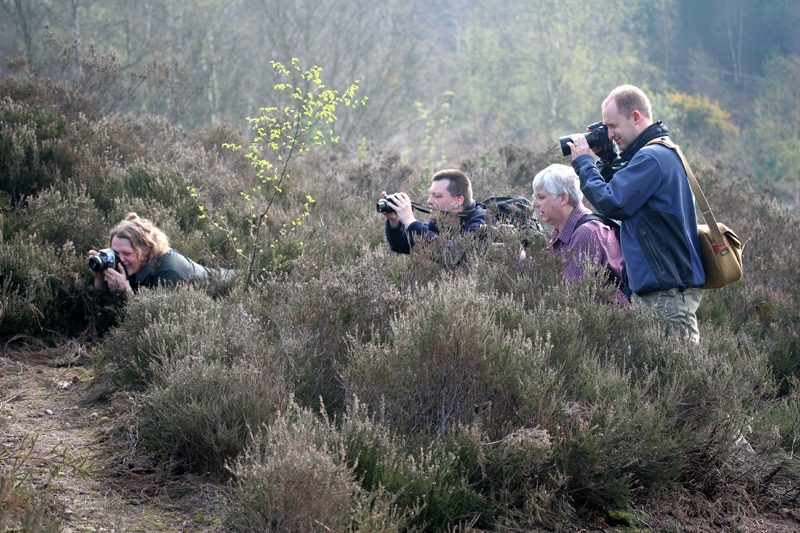 Many beginners get frustrated after hours of looking for elusive reptile or amphibians without success. Finding these animals is not rocket science, however you do need to learn the basics to be successful in the field. SARG survey courses are available throughout the season, with the main event happening each Easter in support of the national NARRS survey, run by the HCT. Keep an eye on the SARG Diary pages for these events, or contact the relevant Reptile or Amphibian officer to be put on an interest list (see the 'contacts' page). If you are interested in learning how to find the wild animals,(and to eventually report your sightings), it is always worth dropping an email through to one of the SARG committee. Most of us are out and about at weekends throughout the survey season (Feb-Oct), and are more than happy for interested people to tag along, and pick up a little knowledge. A SARG trainee handling a rare Smooth snake. The handling of reptiles and amphibians is not normally a recommended practice. Both groups of animals are susceptible to the absorption of harmful toxins through their skins. In the case of reptiles there is the smallest chance of the transfer of the Salmonella bacteria to human handlers. All of the lizard species use autotomy (the casting off of their tail) as a defence mechanism; if handled in the wrong way, the animal is very likely to unnecessarily damage itself. (The scientific name of the Slow worm is Anguis fragilis, the name fragilis is derived from the fragile nature of the animal, and the ease by which is readily breaks off its tail when threatened.) Adders are a venomous species and can be extremely harmful when picked up, although almost harmless when left alone. All of the animals can be damaged if handled too roughly, or in the wrong way. On occasion, it is necessary to handle these animals. This may happen when the animals require rescue, such as from a site earmarked for development, or for activities such as Toad-patrols. Scientific recording of measurements of herpetofauna can be of great use to establish normal growth rates, which can be used for the early identification of risks to populations that would otherwise not be apparent. SARG can offer training for the correct handling of herpetofauna species. Opportunities for handling these wild animals are rare, as we prefer not to unduly stress the animals, however this option is available for the annual NARRS training, where wild animals are temporarily on display to assist identification training. If the need is sufficient, additional courses could be run. Please contact either the Reptiles officer or the Amphibians officer (depending upon your requirement). All contact details can be found on the contacts page of this web site. SARG can take away some of the pain, by providing animal photography training days. Two or three of these events are run each year, for SARG members. The day consists of meeting at a countryside site, where the target animals are known to be present. A short walk, discussing how to find the animals will lead to photographic opportunities. A discussion will follow, where the trainer will provide hints and tips that they have learned from experience, together with a simple guide handout. Trainees will then be encouraged to take photographs of the animals that are found. The afternoon session will be left to the trainees to attempt to find and photograph their own animals, putting into practice what has been learned during the morning session. A trainer will be on hand to advise, and to point out additional animals. Check the SARG Diary for photography course dates (look for the camera icon), or contact the Reptile or Amphibian officer to be put on a provisional waiting list. To handle, survey and maybe even to photograph protected animals such as this Smooth snake requires a licence from one of the National Countryside Agencies. SARG are currently considering if, and how we could provide a way to support professionals and active volunteers to obtain special licences covering rare herpetofauna, as issued by the National countryside agencies (E.g. Natural England). One possible option is to provide specialist training, for a cost, and then maintain a relationship with the candidate, over a mandatory period, where the candidate undertakes voluntary surveys, provides the structured data from these surveys, and can be assessed in the field. If after the conclusion of this monitoring period, SARG considers the individual to be responsible and competent, then SARG could endorse the candidate's application for a special licence, and may even be able to assist with the paperwork. If you would be interested in this approach, please contact Steve Langham to register your interest, and should there be sufficient demand, a policy decision can be made. The decision to offer this service will not be made lightly, as it would involve considerable investment of time by currently licensed members.